Even though I regularly shop for groceries about once a week, I only go to the Asian supermarket once, maybe twice, a year so I tend to stock up on necessities. But I also tend to buy some things that I might not need like that big jar of Ovaltine I bought in early 2009. For those of you who have never heard of Ovaltine it's a brand of sweetened malted cocoa drink mix. My mother used to make it for me and my brothers when we were young. It seems like it was a pretty popular drink among Asian children back then. I think I haven’t had Ovaltine in almost 30 years! When I bought that jar of Ovaltine I planned to use it to make a malted chocolate cake, but I just never got around to it. Until now. The recipe for the cake batter is adapted from "The Sweet Melissa Baking Book" by Melissa Murphy. It's one of the best recipes for devil's food cake I've tried recently. Melissa Murphy really knows her stuff. The cake had a wonderful chocolate flavor. There are two chocolates in the batter: unsweetened chocolate and Dutch-processed cocoa. The combination really gave the cake a deep chocolate flavor. The addition of coffee enhanced the chocolate and also added moisture. The sour cream also contributed to the moisture and tenderness. The cake was moist and not mushy at all. It held together really well when sliced. I made cupcakes instead of a layered cake. 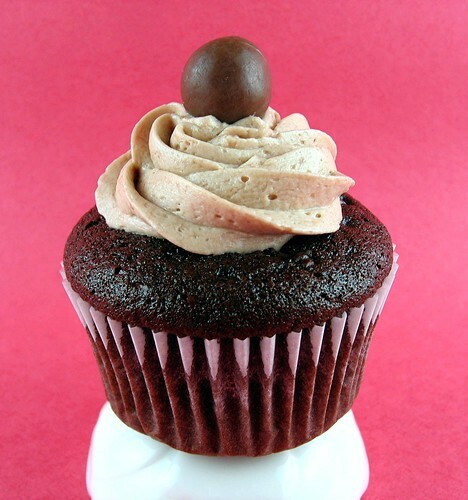 The addition of chopped chocolate covered malted milk ball candy to the cupcake batter is optional. Adding them to the batter seemed like a good idea at the time, but when the cupcakes were baked, if any piece of candy happened to touch any part of the paper cupcake liner it stuck like crazy. Next time I would skip the addition of malt balls to the cake batter. Even though I added some Ovaltine to the cake batter, I'm not sure if I could detect it in the final product. But I wasn't too concerned about the lack of malt in the cake since the frosting would have lots of Ovaltine. I made a butter and confectioners' sugar frosting with a healthy dose of Ovaltine thrown in. It was sweet and malty with just a hint of cocoa. It was the perfect complement to the devil's food cupcake. When the cupcakes were all frosted and sitting prettily on the kitchen countertop, the air was filled with the scent of malt and chocolate. The aroma was so familiar and comforting. It really took me back to my childhood. Preheat oven to 350F degrees. Line 30 cupcake wells with paper liners. In the top of a double boiler set over simmering water, melt the chocolate, stirring occasionally. When the chocolate is melted, whisk in the oil until smooth. Remove from the heat but keep warm over the water. Sift the sugar, flour, cocoa, Ovaltine, baking soda, and salt into the bowl of a stand mixer. Fit your stand mixer with the paddle attachment. In a separate bowl whisk together the eggs and the sour cream until smooth. Add the egg mixture to the flour and mix until well combined, scrape down the sides of the bowl. Add the melted chocolate + oil mixture and mix well. Add the hot coffee in a steady stream until combined. Scrape the sides of the bowl (the batter may be thin). If using, stir in 3/4 cup chopped malted milk balls into the cupcake batter. Divide batter evenly among paper liners. Bake for about 18 - 22 minutes, or until a toothpick inserted in the center shows a few moist crumbs. The center should also spring back when lightly pressed. Remove from oven and place on wire rack to cool in pan for 5 minutes. 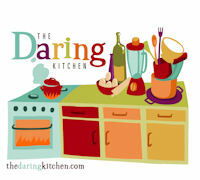 Gently remove cupcakes from pans and cool completely on the wire racks before frosting. In the bowl of a stand mixer, fitted with the paddle attachment, on medium-high speed, beat butter until creamy, about 2 minutes. Add 1 cup confectioners' sugar gradually, beating until light and fluffy, about 2 minutes, scraping down the bowl once or twice. Add another 1 cup of confectioners' sugar and half the milk. Beat until smooth and creamy. Add Ovaltine and remaining milk and beat well, scraping down sides of the bowl. Add vanilla extract and beat on high speed until very light and creamy, about 2 minutes. If the frosting is too soft, beat in some or all of the remaining 1/2 cup of confectioners' sugar. I've thought of using hot cocoa mix in chocolate cake but never Ovaltine. 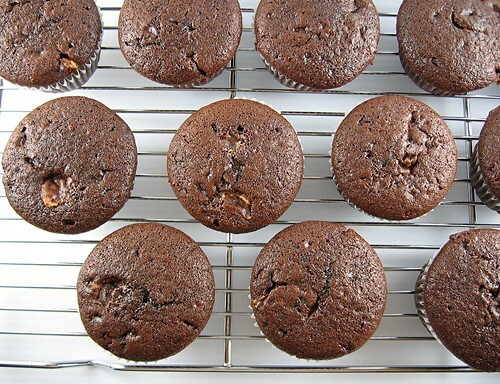 The cupcakes look woderfully dark and moist - the perfect compliment to the sweet frosting. And I love the malt balls for garnish! A great combination! Those cupcakes look so pretty and delicious! My mom used to make me drink Ovaltine as a kid too! I think it is an Asian thing... I had to buy myself a jar for nostalgia's sake a few months ago, and I actually love it now! I make some for my 2 year old daughter and she likes it too. The recipe looks great! I'll have to try it out! They look so pretty I would feel ashamed to eat them. These are beautiful! - I definitely want to make them. 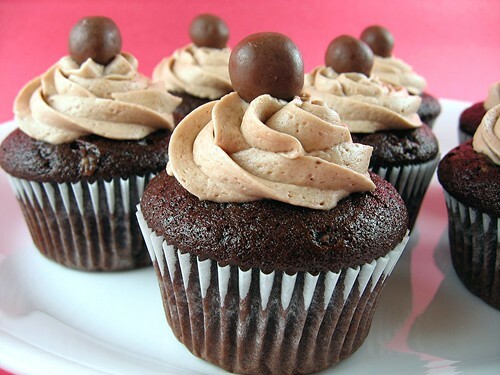 i love ovaltine, and malt balls..will have to try these cupcakes out. 2 and 2/3 cups of sugar seems a bit excessive?